Home > Dot Coms / Internet > Webhire, Inc. Beautifully engraved certificate from the Webhire, Inc. This historic document was printed by the Banknote Corporation of America and has an ornate border around it with a vignette of the company logo. This item has the printed signatures of the Company’s President ( Marty Fahey ) and Secretary. 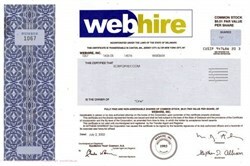 With twenty years of experience in the industry, Webhire is the #1 Choice in Recruiting Solutions. Named as one of the Top 100 ASP's by Information Resource Group, Webhire delivers business-to-business solutions that help employers use the Web to quickly and cost-effectively manage the entire hiring process. Webhire's product line is built around two key products, Webhire Recruiter, Corporate Edition for enterprise-wide applications and Webhire Recruiter, Professional Edition for divisional or mid-sized company needs. Webhire's customer base represents every part of the economy and includes fast-growing firms like Akamai Technologies and The Sharper Image, as well as Fortune 500 corporations such as Northrop Grumman and Heinz. Webhire's largest investors are SOFTBANK Capital Partners and Korn/Ferry International, the world's leading recruitment company. Founded in 1982, Webhire is based in Lexington, Massachusetts (USA). The company's stock peaked around $90 in 2000.